The Sudoku Cube or Sudokube is a variation on a Rubik's Cube in which the faces have numbers one to nine on the sides instead of colours. The aim is to solve Sudoku puzzles on one or more of the sides. The toy was created in 2006 by Jay Horowitz in Sebring, Ohio. 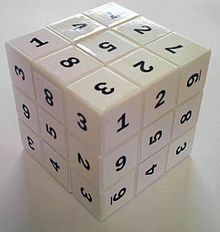 The Sudoku Cube was invented by veteran toy maker Jay Horowitz after he had the idea to combine Sudoku and a Rubik's Cube. Horowitz already owned molds to produce Rubik's Cubes and was able to use them to produce his new design. Mass production is completed in China by American Classic Toy Inc, a company belonging to Horowitz. The product is sold in the United States in retailers such as Barnes & Noble and FAO Schwarz. There are 12 types of Sudoku Cube, which differ in difficulty and are aimed at different age ranges. In a standard Rubik's Cube, the player must match up colours on each side of the cube. In the Sudoku Cube, the player must place the numbers one to nine on each side with no repetition. This is achieved by rotating the sides of the cube. Variations of the Sudoku Cube are the Sudokube and Roxdoku, as well as cubes with 4x4x4 squares instead of the normal 3x3x3. This cube is one of the most difficult of all the cubes because as well as having to know the basic cubes concepts you also have to know basic sudoko concepts and unlike normal sudoku any turn of the cube can wipe out work you just did. 3-D programming languages such as VPython can be used to create simulations of a Sudoku Cube. Such simulations can offer features such as scaling the sudokube (to create 4x4x4 or 5x5x5 puzzles), saving, resetting, undoing, and the option to design one's own sudokube patterns.